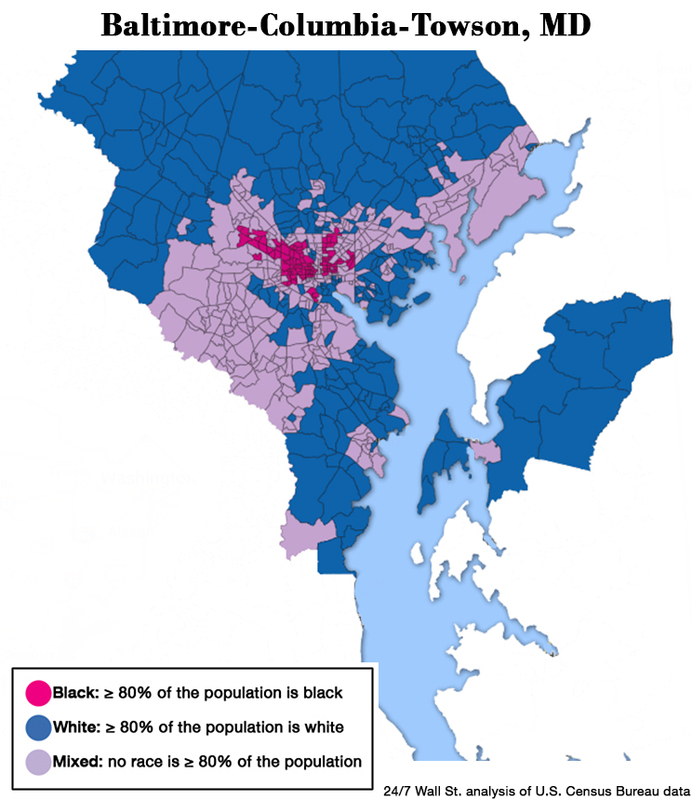 The Baltimore-Columbia-Towson metro area is one of the most segregated places in the United States. Roughly half of the area’s white population lives in predominantly white neighborhoods, just as 41.6% of the area’s black population lives in predominantly black neighborhoods. As is the case in many of the most segregated cities, Baltimore’s present day racial division is the product of a long history of racist policies designed to keep white neighborhoods white. In 1910, it was illegal for a black family to move to a block where over half of all residents were white, and vise-versa. As recently as the 1970s, the Baltimore County executive made it a priority to keep black families out of the county. Segregation does not stop at housing, and in fact contributes to most aspects of life, including poverty, education, police practices, and public order. As recently as April 2015, following the death of Freddie Grey in police custody, the city erupted in violent civil unrest for more than a week. Along with Cleveland and Detroit, the Buffalo metro area is one of several highly segregated Rust Belt cities. 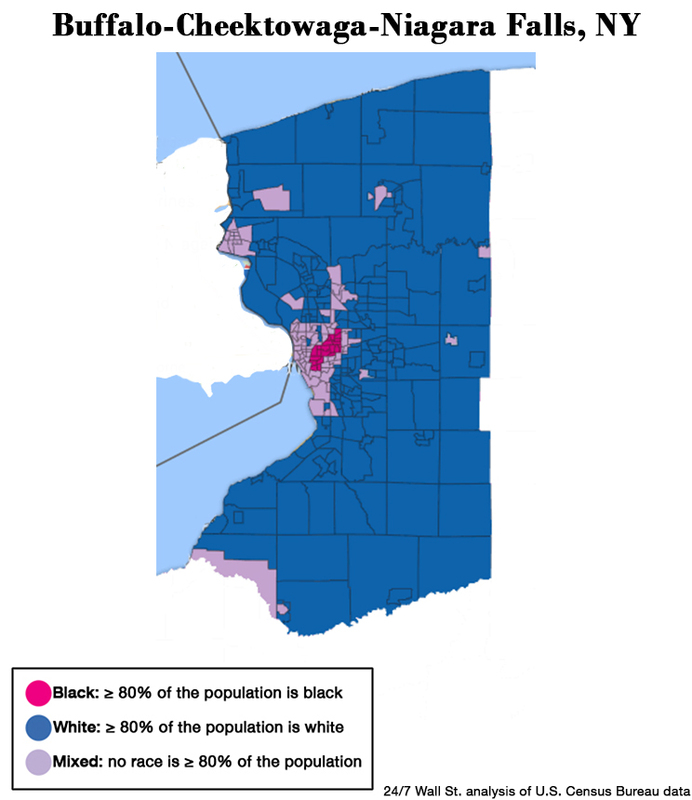 The Buffalo-Cheektowaga-Niagara Falls metro area is one of only four nationwide where more than 80% of white residents live in predominantly white neighborhoods. Black neighborhoods in the Buffalo area are more likely to be poor with less economic opportunity than white neighborhoods. The median income among white households is double the corresponding income among black households, and 36.9% of the metro area’s black residents live in poverty, well above the 9.3% white poverty rate. Additionally, at 14.9%, unemployment among the black labor force is well more than double the area’s 5.9% white unemployment rate. Before tragedy struck in 2005 with Hurricane Katrina, public schools in New Orleans were notoriously segregated. After the disaster, the state took over most of the schools in the city, converting them to charter schools, meaning students would not be tied to a particular school based on where they live. 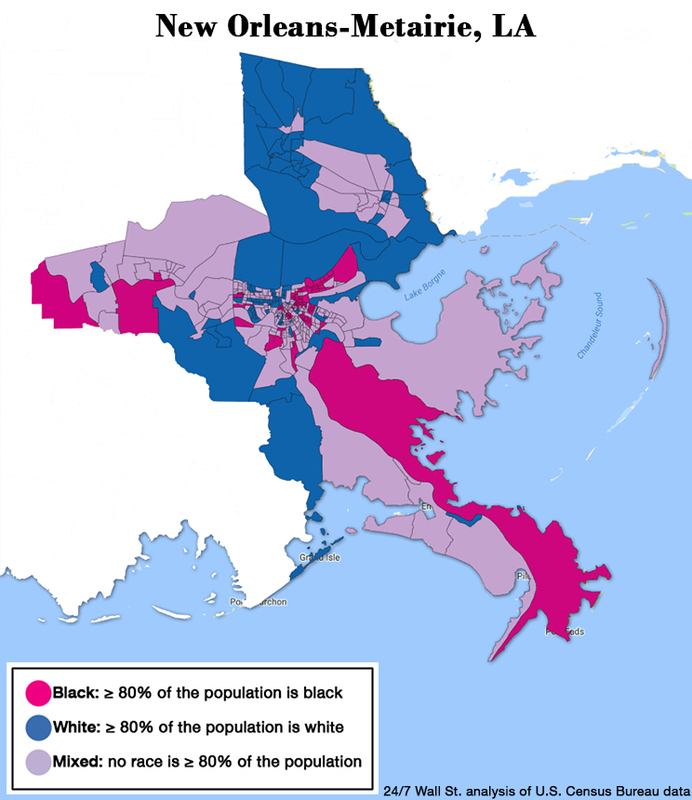 Still, according to a Brookings Institution report published this year, city schools became even more segregated than they were before — and the broader New Orleans metro area is one of the most segregated in the United States. An estimated 43.1% of black families live in predominantly black neighborhoods, which are often far poorer than white neighborhoods. The typical black household in New Orleans-Metairie earns $30,249 a year, less than half the amount the typical area white household earns. White Cleveland residents began moving out of the inner-city in droves around the beginning of WWII, when they were given favorable mortgage financing deals, largely unavailable to black residents. Only about 1% of the metropolitan area’s black population lived in suburbs by 1965. The effects of racist policies that promoted the so-called “white flight” are still evident today. An estimated 45.4% of black metro area residents live in predominantly black neighborhoods, and the black homeownership rate is only 37.4%, roughly half the 74.5% white homeownership rate. The area’s black population also appears to lack many of the economic opportunities that benefit the white population. For example, more than 1 in 5 black workers in Cleveland-Elyria are out of a job, more than three times the area’s 6.2% white unemployment rate.